Examines in fascinating detail a largely unknown but important period of both the Revolution and Benedict Arnold's fascinating life—the campaign to bring Canada into the war as the 14th colony. A brilliant American combat officer and this country's most famous traitor, Benedict Arnold is one of the most fascinating and complicated people to emerge from American history. His contemporaries called him "the American Hannibal" after he successfully led more than 1,000 men through the savage Maine wilderness in 1775. The objective of Arnold and his heroic corps was the fortress city of Quebec, the capital of British-held Canada. The epic campaign to bring Canada into the war as the 14th colony is the subject of Benedict Arnold's Army: The 1775 American Invasion of Canada during the Revolutionary War, now available in paperback. George Washington provided the initiative for the assault when he learned that a fast moving detachment could surprise Quebec by following a chain of rivers and lakes through nearly uncharted wilderness. Washington picked Col. Benedict Arnold, an obscure and controversial Connecticut officer, to command the corps of men who signed up for the secret and dangerous mission. Instead of a twenty-day march, the route consumed months as Arnold's men toiled across 270 miles of treacherous rapids, raging waterfalls, and trackless forests—at times up to their waists in freezing water dragging and pushing their clumsy boats through surging rapids and hauling them up and over waterfalls. In one of the greatest exploits in American military history, Arnold led his famished corps through the early winter snow up and over the Appalachian Mountains to the St. Lawrence River. On the distant riverbank, Quebec beckoned. Arnold crossed his corps and besieged the British. When the second prong of the invasion arrived under General Montgomery, the officers launched a daring assault on the last day of the year upon the walled city. 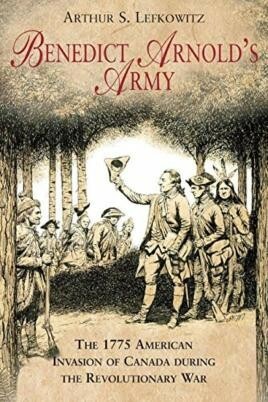 Based upon extensive primary sources and a keen understanding of the terrain, Benedict Arnold's Army examines in fascinating detail a largely unknown but important period of both the Revolution and Arnold's fascinating life. An award-winning author, Arthur Lefkowitz provides key insights into Arnold's character during the earliest phase of his military career, revealing his aggressive nature, his need for recognition, his experience as a competitive businessman, and his obsession with honor. When readers close this book, they will understand for the first time what started one of Washington's favorite and most capable officers down the fateful path to treason. While preparing to write this book, Lefkowitz made numerous trips along the same route that Arnold's army marched. This knowledge, coupled with his peerless research, makes him uniquely qualified to write Benedict Arnold's Army. There is a growing interest in the Founding Fathers and the Revolutionary War as a source of national pride and identity. The Arnold Expedition, as told in the pages of Benedict Arnold's Army, is one of the greatest adventure stories in American history.